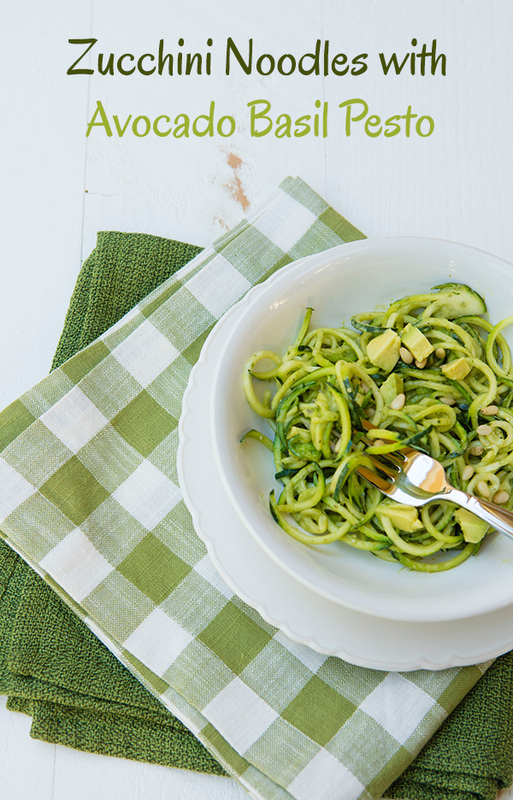 Last year was the year of spiralized vegetables, and everywhere you looked on Pinterest you would come across soups, salads, veggie wraps, and “pasta” dishes made with vegetables prepared with a spiralizer. I will admit, that I too got caught up in the fever, and have three different tools for spiralizing veggies in my kitchen. Unfortunately, like all food trends, I went a little crazy initially using my new kitchen tools, spiralizing everything from zucchinis to sweet potatoes. After a few months however, my spiralizer found its way to the back of my cupboard, and unfortunately like most things, out of sight, out of mind. 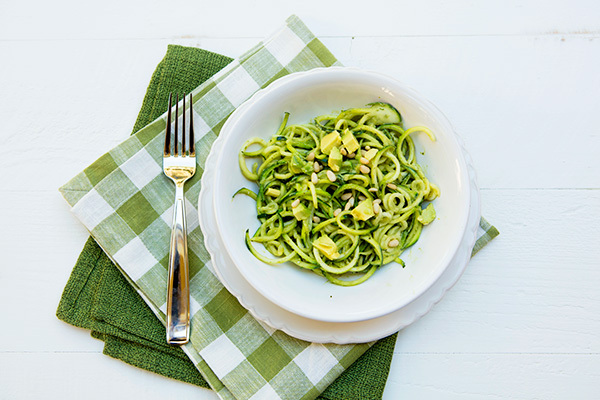 I recently decided it was time to play with my spiralizer again, and I made this zucchini noodle “pasta” dish for lunch. 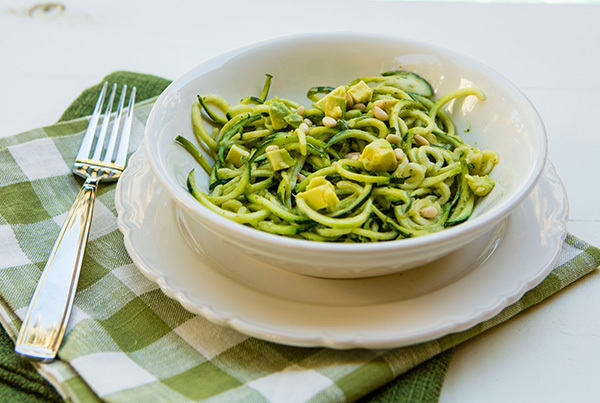 When using zucchini as pasta noodles, it is best to use smaller zucchini that are firmer and have less seeds. These noodles require only a minute or two of cooking, and have a similar texture as regular pasta. Although I usually prepare my zucchini noodles topped with a simple tomato sauce, I had a couple of avocados on my counter that needed to be used up, so I decided on a creamy avocado and basil pesto. I saved half of one avocado that I diced to use as a garnish for my pasta and finished the dish with a sprinkling of lightly toasted pine nuts for texture. This was a very satisfying dish for lunch, and a squeeze of fresh lemon juice brightened it up perfectly bringing all the flavors together. In a food processor, pulse together the avocados, basil, garlic, 2 tablespoons of lemon juice, and sea salt until blended. Drizzle in the olive oil, and continue to pulse until smooth. Taste, and adjust salt and lemon juice as needed. Heat the oil in a frying pan over medium heat, and add the zucchini, tossing gently to warm, for a minute or two. Add the sauce to the pan, tossing the noodles to coat with the sauce. Drizzle the tablespoon of lemon juice over the noodles. 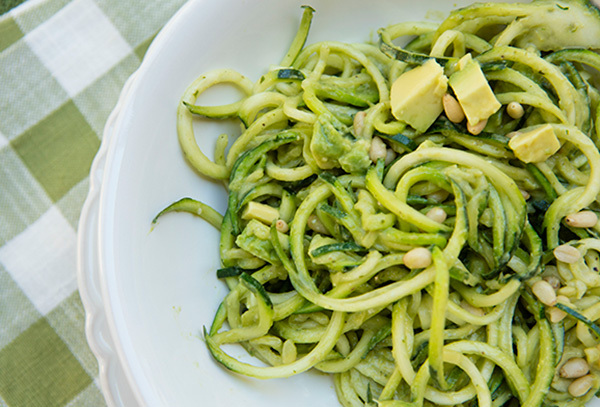 Serve the noodles in individual bowls, topped with some diced avocados, and pine nuts.